Omiyage Blogs: Happy Monday, it's Teatime! Our 2011 Japanese calendars are oh so lovely... and we're just about one technical difficulty away from having them up on Omiyage.ca for you to enjoy too! In the meantime, how about a sneak peek at a spooky October from one of our favourites?! Ok, a bit more cute than spooky, right? The Happy Teatime Calendar is chock full of seasonal teas and kawaii characters. 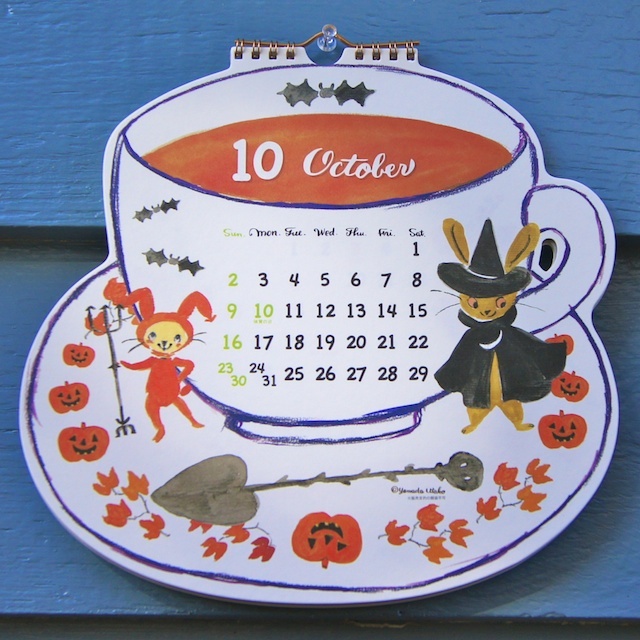 At $17.50 Canadian, the Happy Teatime Calendar from Karel Capek (Japanese purveyors of cute tea and accessories, not the Czech writer), is a perfect gift for the tea lover in your life! Can't wait for it to appear on Omiyage.ca? Send us a message at info[at]omiyage.ca to preorder yours today - or for more info.